CHICAGO (AP) All that DeMar DeRozan wanted to talk about was the lift Toronto’s bench provided. As for his recent scoring tear? ”I don’t think nothing of it,” he said. 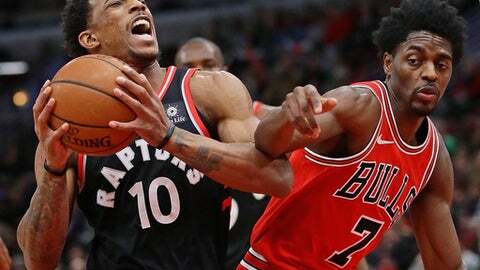 DeRozan had 35 points, Delon Wright set career highs with 25 points and 13 rebounds, and the Raptors beat the Chicago Bulls 124-115 on Wednesday night. DeRozan came up big again after scoring a franchise-record 52 points in a win over Milwaukee on New Year’s Day. He was particularly good in the third quarter this time, scoring 18 points after being held to nine in the first half. DeRozan also shot 5 of 8 on 3-pointers and converted all 10 free throws. Wright had his first career double-double and hit four 3s to lead a big effort by the bench. He scored 12 in the second quarter and eight more points in the fourth to help Toronto pull away for its ninth win in 11 games. Serge Ibaka and Kyle Lowry scored 16 apiece for Toronto. Fred VanVleet, from nearby Rockford, added 13 points, and the Raptors’ reserves outscored Chicago’s 54-39. He’ll get no argument from coach Dwane Casey. Justin Holiday led Chicago with 26 points, and Lauri Markkanen added 22 points and 12 rebounds. Nikola Mirotic scored 20, but the Bulls dropped their third straight. The Bulls looked sharp early on, with a 10-point lead after the first quarter. But they couldn’t sustain their edge on defense and were impatient on offense – particularly the second unit. Chicago was leading 92-90 early in the fourth when Toronto went on a 16-2 run. Lowry hit a 3 to make it 106-94 with 6:39 remaining, and the Raptors remained in control the rest of the way. The Bulls hope to decide on a return date for G Zach LaVine early next week. LaVine will travel with the team to games at Dallas and Indiana on Friday and Saturday. Hoiberg said the two-time slam dunk champion will meet with doctors, trainers, management and coaches after the Bulls return home. LaVine averaged 18.9 points in 47 games for Minnesota last season before tearing the anterior cruciate ligament in his left knee. The Bulls acquired him along with Kris Dunn and Markkanen in the trade that sent Jimmy Butler to the Timberwolves. Raptors: Toronto had dropped six straight at Chicago. … The Raptors were 19 of 19 at the foul line. … Wright hit 10 of 15 shots. Bulls: Markkanen has led the Bulls in rebounding 13 times and has eight double-doubles. He is averaging 21 points over his last four games. … C Robin Lopez had 12 points and a career-high six assists. … Mirotic has scored 20 or more in eight of his 15 games. Raptors: Visit the Milwaukee Bucks on Friday. Bulls: Visit the Dallas Mavericks on Friday.